Home / Opinion / Sonza to Senate on GMA as House Speaker: "Senators must learn a little or simple courtesy. Respect!" Sonza to Senate on GMA as House Speaker: "Senators must learn a little or simple courtesy. Respect!" 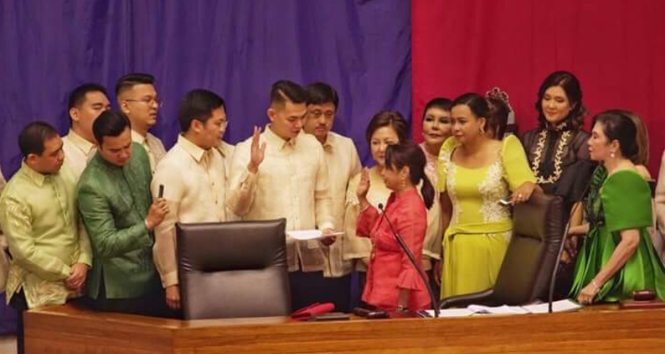 Veteran broadcaster and former TV host, Jay Sonza, once again wrote a very striking opinion, this time about former President Gloria Macapagal-Arroyo's taking over the top post at the House of Representatives from Davao del Norte Rep. Pantaleon Alvarez. It can be recalled that last Monday, July 23, 2018, Arroyo, the country’s former President, was elected Speaker by 184 House members, becoming the 21st leader of the House and the first woman to hold the post. Arroyo's oath taking surprised many, including the senate. Reason why some of the country's senators reacted negatively and unfavorably about it. These senators reactions dismayed the veteran journalist, Jay Sonza, that made him took to social media and blasted the Senate, particularly those Senators who criticized GMA's election as Speaker of the House of Representatives. Known to be fearless in speaking his mind, Sonza then said that senators must take in a little politeness and appropriate dignity accustomed of lawmakers. "Senators must learn a little or simple courtesy and proper decorum expected of legislators. ", he said. 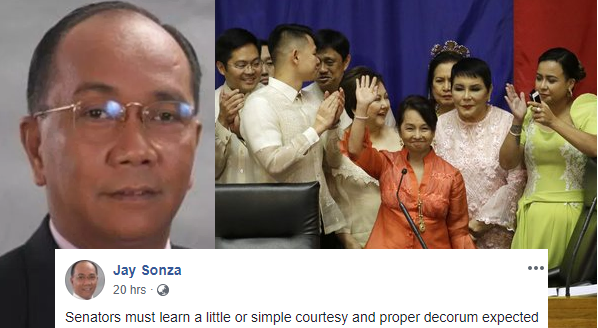 Likewise, Sonza said that whatever individual preferences or issues other senators have with the new House Speaker, they should remain quiet about it, unless, they are perfectly clean and unstained as public servants. "Whatever personal biases or issues Senators Poe, Ejercito and Lacson have, they should keep it to themselves. Mabuti sana kung walang maaring itapong putik sa inyo." "Hindi naman kayo ganoon kalinis na public servant. Akala mo naman malilinis kayo. Iyong isa sa inyo pugon ang bibig at lasenggo at palaging wala sa hulog. Iyong isa may kaso rin ng paglulustay ng pera ng bayan. Iyan isa may kaso rin ng maramihang pagpatay. ", the veteran journo exclaimed. Sonza correspondinly added that the House is just the same as the Senate and they need to respect the wishes of representatives of the House as the latter have respected their choice for a new leader of the Senate then. "Kailangan igalang ninyo ang kagustuhan ng mga kinatawan ng House of Representatives. As they have respected your choice for a new leader of the Senate. ", he added. He then ended his post by asking the senators to just 'RESPECT' the House' decision. "Senators must learn a little or simple courtesy and proper decorum expected of legislators. 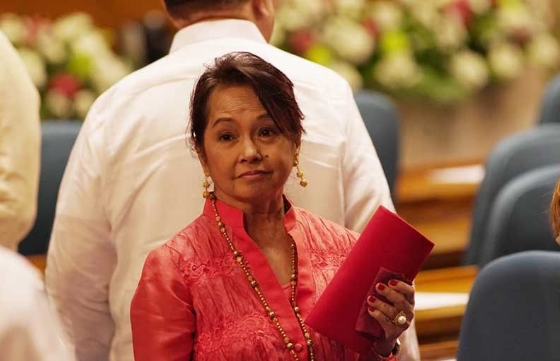 Calling the new Speaker of the House of Representatives (malaking kapulungan ng Kongreso) Gloria Macapagal Arroyo names is conduct unbecoming. The House is a co-equal of the Senate. How would they feel if representatives start calling your leader and members of the Senate names? Whatever personal biases or issues Senators Poe, Ejercito and Lacson have, they should keep it to themselves. Mabuti sana kung walang maaring itapong putik sa inyo. Hindi naman kayo ganoon kalinis na public servant. Akala mo naman malilinis kayo. Iyong isa sa inyo pugon ang bibig at lasenggo at palaging wala sa hulog. Iyong isa may kaso rin ng paglulustay ng pera ng bayan. Iyan isa may kaso rin ng maramihang pagpatay. Kailangan igalang ninyo ang kagustuhan ng mga kinatawan ng House of Representatives. As they have respected your choice for a new leader of the Senate. Iyon ang kagustuhan nila, hindi naman mga senador ang kailangang bumoto kay GMA. Bakit nangialam ba ang mga congressman ng iboto ninyo si Sotto bilang Senate President? Hindi naman, di ba. R E S P E C T !"